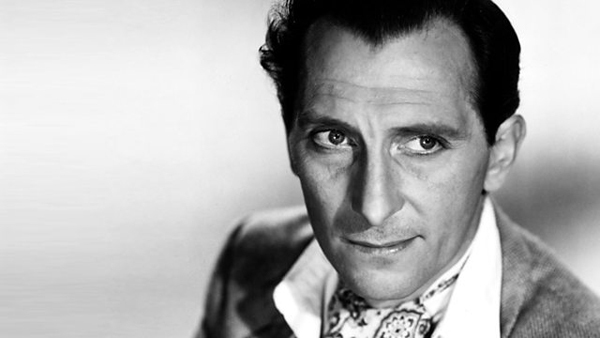 May 26th and 27th are the birthdays of three of horror cinema’s greatest legends, Peter Cushing, Vincent Price, and Christopher Lee. To celebrate their birthday, Psycho Drive-In has enlisted three of our most devoted horror fans to share a little about their favorite performances by these Grandmasters of Horror. Without further ado, here’s Paul McCoy, Dan Lee, and Raul Reyes singing the praises of Curse of Frankenstein, The Last Man on Earth, House on Haunted Hill, and Horror of Dracula! 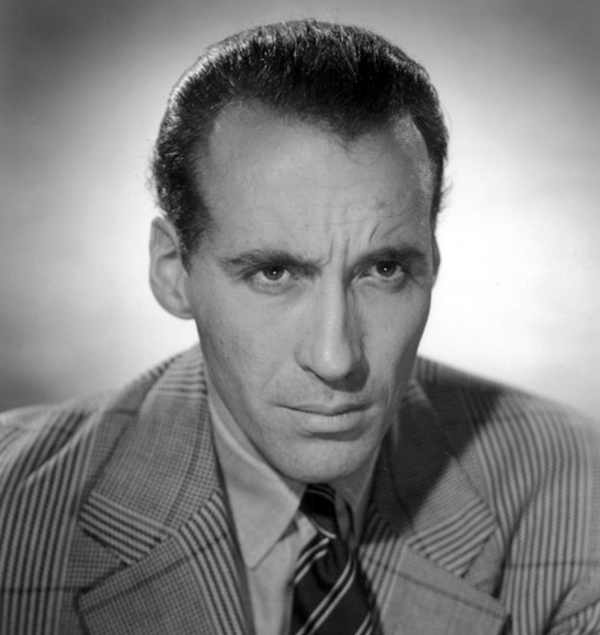 Cushing began working in Hollywood in 1939, but didn’t have his first major film role until 1948’s Hamlet. The 50s were mostly spent working in television (most notably for me, appearing in the BBC’s 1954 adaptation of Nineteen Eighty-Four which was scripted by the creator of Quatermass, Nigel Kneale), but in the 60s he found his niche as he began working for Hammer Studios. 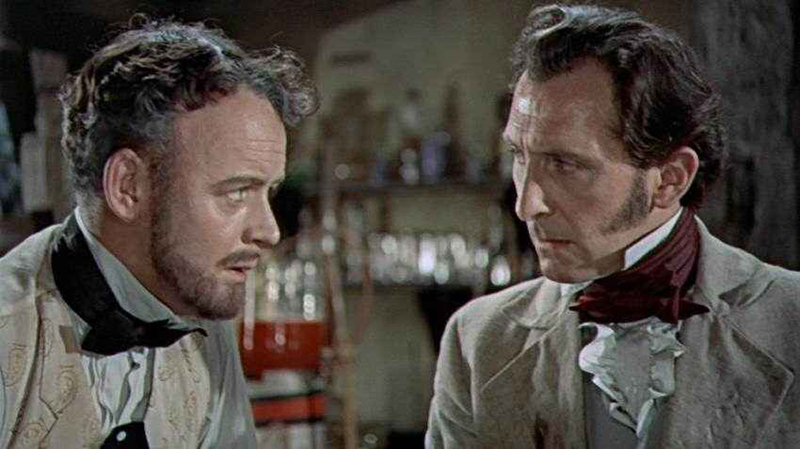 It was there that he cemented his fame playing Professor Van Helsing alongside Christopher Lee’s Dracula, and Baron Victor Frankenstein, again with Lee taking on the role of the monster (initially, anyway). He was also perhaps the greatest Sherlock Holmes and as much as I hate to admit it, he made a fine Dr. Who in the non-canonical Dr. Who and the Daleks and Daleks – Invasion Earth: 2150 films. 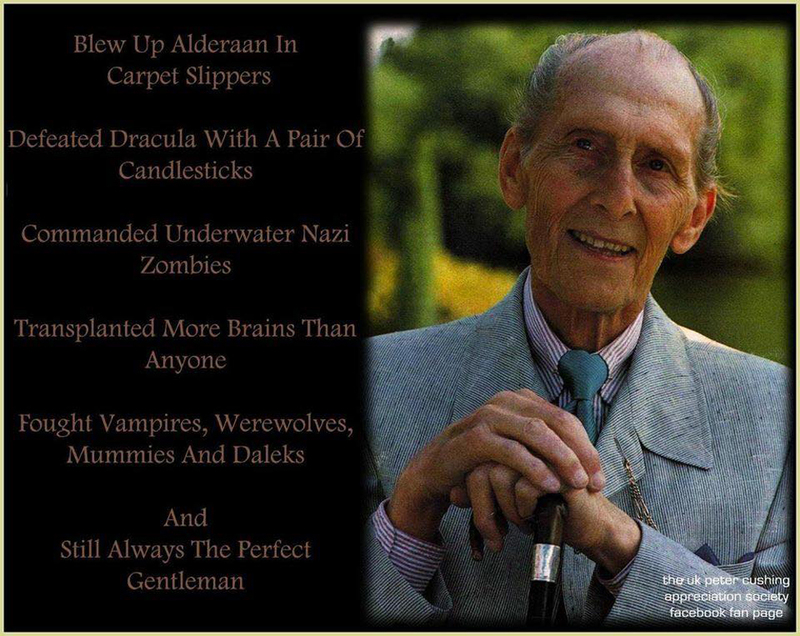 Oh yeah, and he blew up Alderaan as Grand Moff Tarken in Star Wars while wearing slippers. But my favorite of his roles was Baron Frankenstein. He played the part six times for Hammer Studios, and while every film has at least something good going for it, my personal favorite is the first: Curse of Frankenstein (1957). 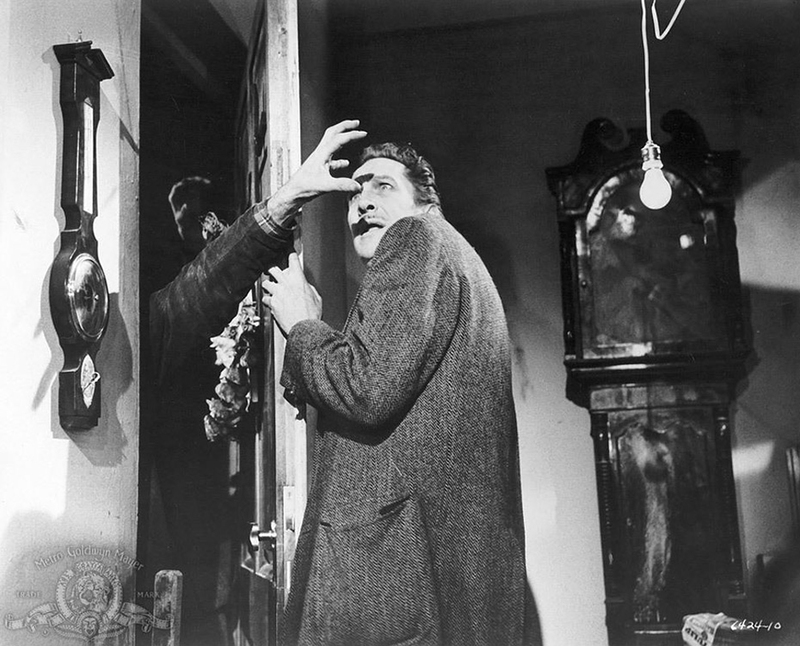 In Curse, Cushing’s Frankenstein is a narcissistic sociopath and from his very first appearance on-screen, you can see he’s having the time of his life with the role. This was both Hammer’s first Frankenstein film and their first pure horror film, and it had been a long time coming. While Mary Shelley’s original novel had become public domain, Hammer had to carefully avoid references that may have originated in Universal’s 1931 adaptation to avoid lawsuits. So the film takes its time to make sure we see that Cushing’s Victor Frankenstein is both a rake and a fiend with little or no regard for social convention. He’s having an affair with the maid while arranging to be married to his cousin, Elizabeth (Hazel Court); his childhood tutor is appalled by his desire to create life rather than just resuscitate the newly dead (which is kind of a nitpick, if you ask me); and he has no qualms whatsoever about letting people die, or killing them himself, if his needs require it. Directed by the brilliant Terence Fisher in beautiful Eastmancolor, Curse of Frankenstein is a glorious romp through the darkness, and every single scene is a sight to behold. The set design and dressing is simply amazing, from the candelabras to the wall clocks, from the mad science lab to the rooftops. I was particularly taken by just how disgustingly filthy Frankenstein’s jackets are at almost all times, stained with blood, dirt, and viscera. And if you want a truly original creature, Christopher Lee’s brutal, animalistic monster is both disturbing and heartbreaking – particularly after he’s been brought back from death a second time and undergone unspecified brain surgery. Curse of Frankenstein was the first, and perhaps greatest of Hammer’s Frankenstein series (I know there are challengers to that title), and it is largely the performance of Peter Cushing that elevates it to this stature. 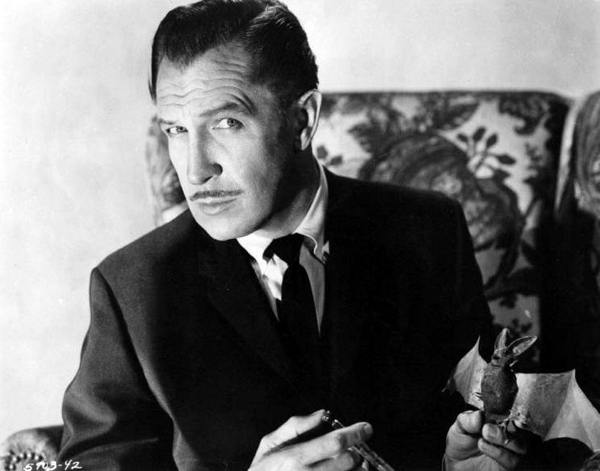 Let’s just be clear about something, Vincent Price IS a legend. Yes, he died in 1993 but that by no means detracts from his status as an immovable icon within the horror genre. From stage to screen to sound booth (and, of course in the kitchen) the man is still making us shiver in fear from beyond the grave. The man brought to life the terror of Edgar Allan Poe in all of Roger Corman’s classic adaptations like House of Usher and Masque of the Red Death. He was The Abominable Dr. Phibes and the horrifying voice that summoned the dead from their graves in Michael Jackson’s Thriller and so many other nightmare inducing characters through his fifty year career that it’s really hard to nail down just one of the fiends to write about. I was asked to pick my favorite work and write a little about it but the problem is there are two that I always find myself torn between when I look for my favorite. The first is 1964’s The Last Man on Earth, the first of four film adaptations of Richard Matheson’s genre-changing story I Am Legend. In the film, Price portrays Robert Morgan (Robert Neville in the book), a scientist who struggled valiantly to find a cure to a disease that slowly but steadily withered away the population of earth until he alone was left alive. Unfortunately for Morgan, however, the dead returned as nocturnal monsters craving fresh human blood to survive. But the undead weren’t the only threat staring him down as alcoholism, depression, and a sense of listless despair made him wonder what, if anything, was worth fighting for. In the end, splayed out across the altar of a church belonging to the new inhabitants of the earth, impaled on a spear and dying slowly, he rages that he alone is the last man alive and muses silently at what he has become, the legend of the day-walking vampire killer. The story is amazing, the best portrayal of the book by far, but it clearly wasn’t one of Price’s most enjoyable roles. His acting was, at times, wooden and uninterested. There again, that could simply have been an extension of the character’s overall feeling of defeat and loss and a show of the talent and genius that was Vincent Price. My other favorite is the 1959 horror classic House on Haunted Hill. As the eccentric, seemingly murderous Frederick Loren, he invites his odd assortment of guests to stay the evening in a haunted home, a party for his fourth wife Annabelle. To marry once is madness. To repeat it three more times after that is beyond insane, though hardly the most terrifying part of the story. The plan seems straightforward to all involved. Each person has been given a pistol and a chance to win a small fortune and all they have to do is make it through the night. Plans within plans unravel as the Lorens attempt to use their guests to their own ends. Frederick is desperate to catch his wife with her lover, while Annabelle is plotting to drive one of her guests mad with all the haunting stories and terrifying visions in the home in the hope they might “accidentally” kill her husband. By the end of the movie, the mechanisms of the various plots are revealed and the viewer finds himself wondering if any of the supernatural horrors had ever been real or if they had all been manufactured, a part of a seemingly perfect crime. Price’s character was so memorable that in the 1999 remake the character of Steven Price (Geoffrey Rush) was made as a tribute to the legendary actor. Thirteen Ghosts, House of Wax, The Fly, Tim Burton’s Vincent… there’s really no shortage of good movies to watch him in. Vincent Price lives in the characters he left behind. From his narration and stage presence to the continuing homages done by writers and film makers, death itself seems powerless to stop him. It must have seemed like an impossible task in the late 50’s when Hammer Studios decided to make an updated version of the classic story of Dracula. The word “monsters” had been utterly dominated by Universal Studios in the timeless films of the 30s. And the great Hungarian stage actor Bela Lugosi created an icon when he stood stop the stairs and said, “I am Dracula.” He was ethereal, suave, romantic and melancholy. But was he scary? For audiences at the time, sure. But then Hammer Studios chose Christopher Lee to headline their take as our sanguine hero, and in what is now offensively obvious, they made him terrifying. This Dracula was a monster. He physically towered over all at 6’5. It doesn’t take long in Horror of Dracula to see what a crazed beast Dracula could be. After a brief introduction with Jonathan Harker, behaving perfectly regal and polite as the camera looks up to him, the monster arrives – his fangs caked in blood and his eyes like a demon from hades. The rage in his eyes makes us believe this man took great pleasure in the art of impalement. The rest of the film unfolds in gorgeous color and Hammer does a magnificent job at set decoration, the courtyard at night in the moonlight and fog, in particular. Peter Cushing makes a great Van Helsing, a worthy opponent for the Count. But when Dracula shows up, it’s spellbinding. Particularly the seduction of Mina. Dracula appears at the bottom of her steps with a powerful gaze and ascends to the magnificent pulsing score of James Bernard. Whereas Dracula (1931) left much to the imagination, as many things happened offscreen, Horror of Dracula leaves it all on the table. When our “hero” is defeated by sunlight we see him in torturous agony as he crumbles into ashes. A new incarnation of an already established icon was born. After a period of monster movies with an emphasis on nuclear radiation, giant bugs and outer space. 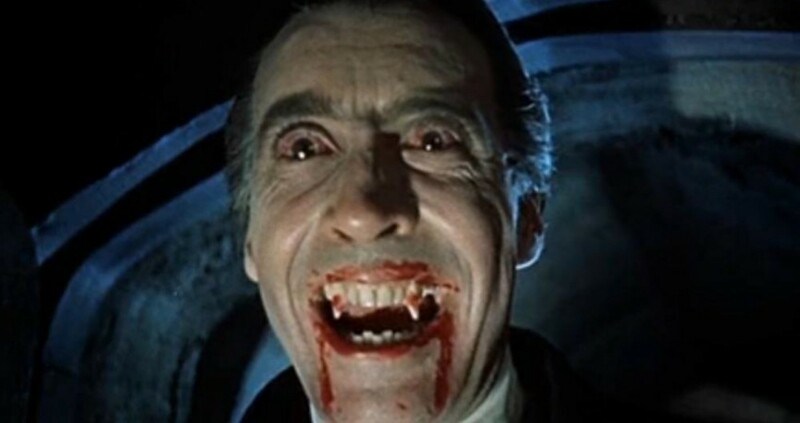 It was Horror of Dracula and Christopher Lee who made Dracula count again.